As he talked with his senior leadership team, Warren shared his deep frustration with how MSI was going to meet its business challenges over the next three years. There were new, lower cost competitors nipping at their market share. The speed of new product releases had increased from twelve months to seven. This meant more pressure on MSI to achieve new efficiencies without sacrificing quality or raising costs. The introduction of new technologies in marketing, production, and quality control meant dramatic changes in the way they would need to do their work. There were also workforce pressures. Half the employee base had been loyal to MSI for an average of twenty years. Many of them were used to their jobs and were either unwilling or unable to learn the new technologies. The other half of the workforce was younger, but more willing to learn. They were motivated by life style issues and building marketable skills for their next jobs. Loyalty to MSI was not a key concern, and yet they expected management to provide more benefits and increase participation in decision-making. They wanted to rise quickly in the company, and were able to move on if they encountered too many barriers. MSI’s business performance was satisfactory, but not stunning. The projections showed moderate growth, but forecasts were only forecasts. Customer satisfaction remained steady at 88%; they needed a breakthrough. Employee satisfaction numbers were dropping, with management consistently getting low scores on measures of trust, communications, and involvement. And even though people were working longer hours, per capita production had dropped, while turnover had a slight up-tick to 23% annually. In addition, after ten years of change programs that included total quality, re-engineering, downsizing, outsourcing, and restructuring, the workforce had come to view job security as a relic of the past. Distrust was in full bloom. Warren and two of his key change management advisors, Trevor and Sarah, huddled after the meeting to discuss how to rebuild the trust level required for MSI to meet its growth and performance targets. They knew they needed to transform the workplace one more time, but what would it look like? What values would be needed to drive it? What type of covenant between leadership and the workforce would reduce fear and increase trust? What type of corporate framework would enable them to balance their new business realities with the needs of their people? 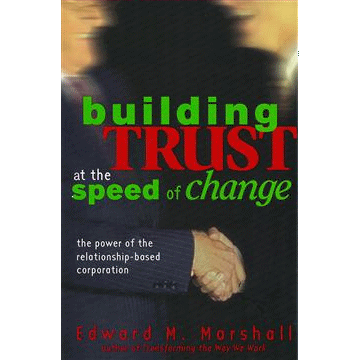 Our most critical leadership challenge is to catch up with the speed of change by transforming the predominant approach to business from a system based on power, compliance, and transactions to one based on trust, collaboration, and relationships. Our challenge is to leave behind the politics of fear, and to evolve toward what will be called a Relationship-Based Corporation. A Relationship-Based Corporation is a framework for leading and managing a business that honors the fundamental needs of the individual, builds trust-based relationships, and creates a work environment that can tap into the full potential, intellectual capital, and energy of the workforce, so they are able to produce breakthrough results. What would it take for MSI to become a Relationship-Based Corporation, to meet its many challenges, and to build trust at the speed of change? What would success look like? For MSI or any other business organization to be successful in the future, it would first commit to a journey of evolution from a culture of fear to one of trust. This is both a pragmatic as well as an ethical response to a market built on increasing rates of speed. To do that, leadership would move beyond the belief systems of the past. Second, they would adopt a philosophy that recognizes that it is people who make change happen, and that the workforce must own that change to implement it successfully. This view also recognizes that speed comes from trust-based work relationships; and that businesses can achieve their full potential by leveraging those relationships. Like a space craft jumping to light speed to reach its destination, the Relationship-Based Corporation is the most effective vehicle for reaching sustainable competitive advantage. With this approach to leading and managing, business leaders need not compromise their integrity by focusing on speed at the expense of people. Speed and trust are not only compatible, there can be no sustained speed at work without trust. If we want to win in the Information Age, we have but one choice—to evolve.